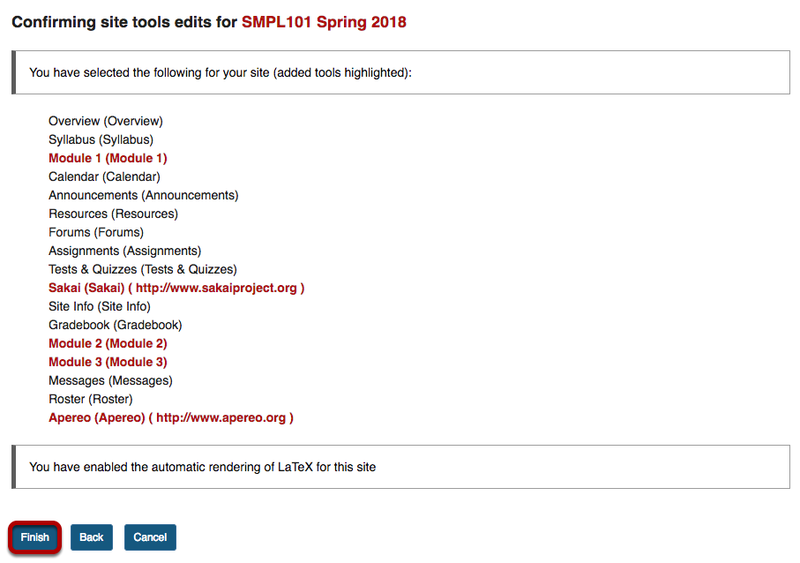 Sakai Community DocumentationSakai 19 User Guide (English) Site InfoHow do I add tools to my site? Sakai has many different tools available to use in your course or project site. You may choose which tools you want to use and may add or remove tools at any point. Select your set of tools. As you select tools from the General list on the left side of the screen, they are added to the Selected tools list on the right side of the screen. The right side of the screen displays the tools you have selected. Below the Selected tools you can enable MathJax for specific tools in your site by checking the box. See more information on enabling LaTeX at How do I add LaTex language to my course site? 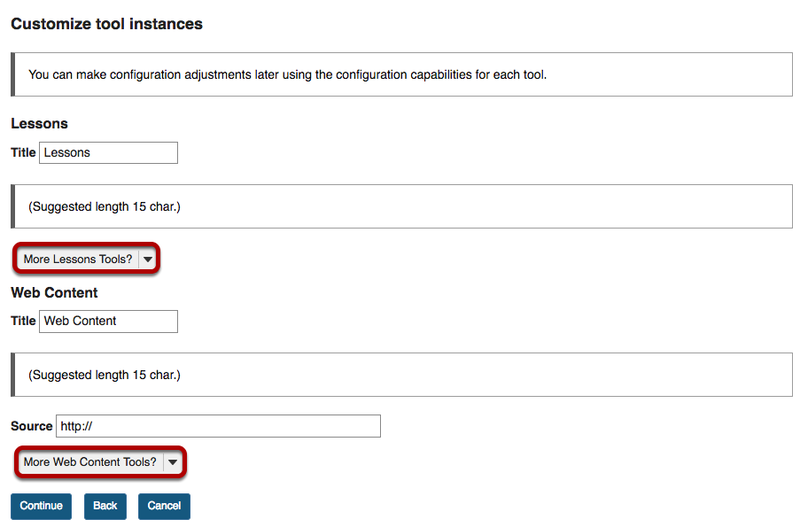 In addition, you can enable Lessons subpage navigation in the left tool menu by checking the box. See How do I enable Lessons subpage navigation in the Tool Menu? for more information. For some tools such as Lessons and Web Content, you can add multiple instances of the tool. The Lessons tool may be used as a single tool on the Tool Menu where students click to see all Lessons, or there can be multiple Lessons tools added to the Tool Menu so that each tool is a separate Lesson. See the Lessons tool chapter for more information. The Web Content tool points to any URL you enter and you may create as many of these as you want. Click on the More Lessons Tools? or More Web Content Tools? drop-down menus to add additional instances of these tools. The example above shows three Lessons tools (Module 1, Module 2 and Module 3) and two Web Content tools (Sakai and Apereo). If your institution has preconfigured any system-wide External Tools, you may click on External Tools section to expand the list, and select from the available items as needed. Once you have made all of your tool selections, scroll down and click the Continue button to save your customizations. New tools added are shown in red font. Confirm that these are tools you want to add and click the Finish button. New tools are typically added to the bottom of the Tool Menu once you save your changes. See the How do I rearrange or rename the items in the Tool Menu? tutorial for instructions on how to change the tool order. Prev: How do I edit the site information? Next: How do I rearrange or rename the items in the Tool Menu?